Once cooked you can add dried fruit - sultanas, raisins, cranberries. Dried fruit has a lot of calories so go easy - 1/2 cup should be plenty. 1. Measure oats into large mixing bowl. 2. 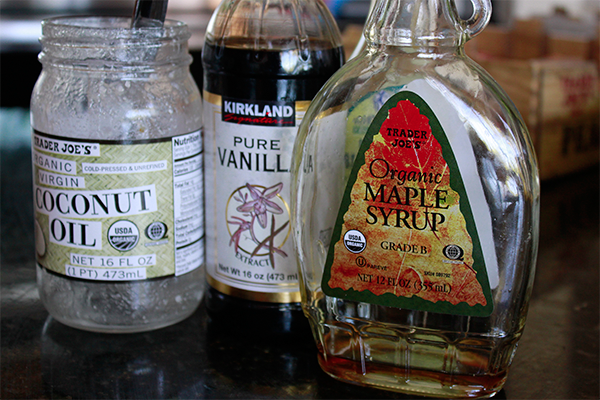 Combine oil, syrup and vanilla. If using coconut oil and it is hard - warm to bring to room temperature. You can put jar into a bath of hot water or zap for a few seconds in the microwave. 3. 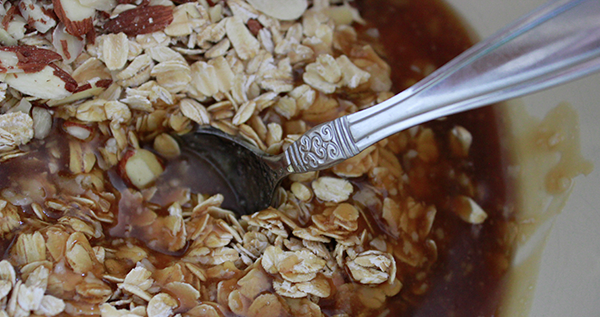 Pour oil and syrup mixture over oats and mix well. Add nuts and combine well. 4. Pour oat mixture onto large tray lined with parchment paper. Press down mixture. 5. Bake for 20 minutes at 300 F.
6. Allow to cool then add your dried fruit and combine. Store in a glass container or other airtight container. 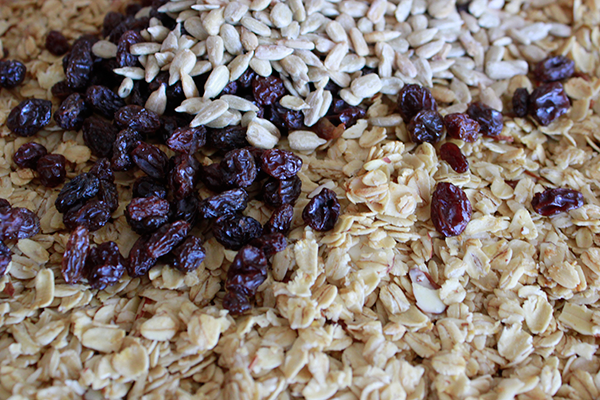 You can serve your granola with milk, almond milk (my preference) or even with plain yogurt. Add fruit in season - I loved berries - blueberries, raspberries or strawberries. Another favorite - a grated apple is really great combination. If you want some extra protein add 2 tablespoons of chia seeds and even some linseeds (also called flax seeds). *A good rule of thumb. Never buy processed foods that contain anything you can't pronounce. That way you stay away from nasty artificial additives.